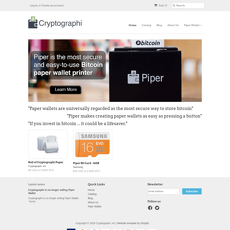 Bitaddress paper wallet service is ingeniously simple and intuitively easy to use. Users looking for top level security using a paper wallet will immediately generate a unique Bitcoin private key and public key using their mouse to randomly generate numbers and letters, resulting in the keys being completed by you and not the websites own software. Bitaddress is widely known to be relatively safe and have a very low level of risk. Disconnecting from the internet and then creating the key increases security a little as well. The website ensures that once you leave or even refresh the page, the previously generating key cannot ever be retrievable. The site never saves private keys and will never distribute any information regarding its users. Single wallet: This is one single pairing of a Bitcoin address and its corresponding private key. 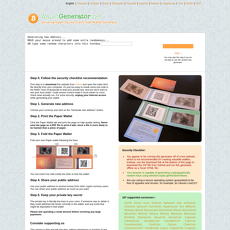 Paper wallet: This is a graphically enhanced wallet which includes your single wallet information that can be downloaded and printed out. Split wallet: This will split the key and later recombine specific parts using polynomial math to regain the full constructed address. 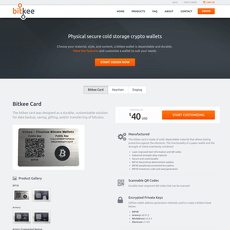 Bulk wallet: This function will create multiple wallets and private keys on demand. Brain wallet: This is a wallet where the owner remembers a specific passphrase or seed phrase, and these are never recorded anywhere else but the owner’s own brain. Bitaddress also includes a nice tool where you can input your key to view the contents of your wallet. Teaches you how to use it in the most secure way possible. 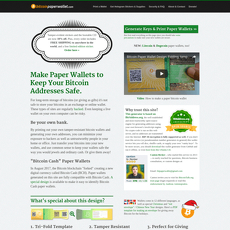 Essentially the same as any other paper wallet tools.